'What I wore on Christmas Day!' A combination of Long Tall Sally, Monsoon, Boots, M&S and Olivia Burton. It was a fairly busy one, dashing here and there but I managed to twist someones arm to grab a photo of my outfit or an OOTD post. I opted for a party skirt and warm jumper combination and indulged my inner Audrey Hepburn by choosing a little black top and necklace look. I've mentioned a few of these items on the blog before so I hope long term readers will enjoy this outfit put together in in 'real' life. See the built in jumper neckline? Great if you are in a rush too! I always wear a cami top under a jumper. The problem with winter is that you freeze the moment you set foot outside, and then overheat at your destination. Layers are key. I have mainly opted for a floaty top if going to a formal event (mostly the double layer cami from Long Tall Sally (and it is currently in the sale!) link). Normally I'll just wear a plain cami if I need an everyday extra layer which will look respectable but not too dressy. (Incidentally LTS seem to have most of their cami tops reduced to £7 and if they are they same as the ones I have had previously then they are 1) warm 2) so very soft and 3) have adjustable straps 4) suitable for anyone of average to tall height link). Tights: Boots standard black tights 70 denier. I generally have to get size large because they the size for tall slim ladies. I really wish that they labelled them differently. I think us tall girls feel like we stick out anyway, so having to pick tights 2 sizes larger 'just' because they will fit your height... Anyway, size aside I have been getting my tights from Boots and M&S since my school days so I haven't really branched out. I put my toe through this pair, and need to buy some more. I'm happy to take recommendations if you I should cast my net wider than Boots and M&S! Plain black leather court shoes from M&S. These FootGlove have insolia technology i.e. inbuilt insoles that support your feet. It's no secret that high heels can really damage out bodies by changing our posture and putting all the weight onto the ball of the foot. Insolia was (I believe) designed by a chiropodist to help evenly distribute a persons weight over their entire foot- even when wearing high heels. They are so comfy to wear. I can easily wear them all day (unlike some other brands in my wardrobe which leave me shuffling like a robot after 1 hour). M&S also carry some 'everyday' heel heights- i.e. 1-3 inches. I found these by accident when I'd exhausted local shoe shops and needed a pair of plain shoes. Defeated, I walked through M&S on my way home and saw these. Resigned to failure, I tried them on and was really surprised. They don't stock this style anymore, but there are similar ones here (link). Life Lesson: Try on things- even if you think they wont fit/suit you. 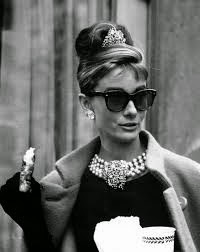 Audrey Hepburn with her black top and statement necklace (and tiara). Jewellery: Because of the inbuilt necklace in the jumper, I kept my accessories simple. Just a pair of locally made glass earrings and my Olivia Burton blue butterfly big dial watch. It's from a previous season (blogged here) but I have found the same design with a brown strap in the current season at Topshop (link). I am a big OB fan- I think the designs are gorgeous. I don't do many OOTD posts, so please be kind! Please feel free to recommend any brands of tights! If you did a Christmas OOTD then please send me a link below! Also don't forget my Fiorelli bag and goodies giveaway! Disclaimer: The LTS items are part of an ongoing collaboration, all other items were purchased. 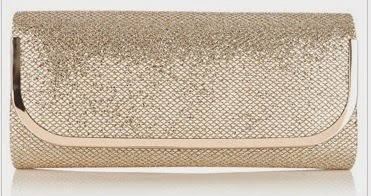 WIMW: Two Sequin clutches: Haul. Isn't it pretty? Love at first sight. 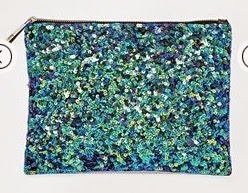 Mermaid Sequin Clutch. Very spacious, faux leather back, internal zip pocket and TONNES of SEQUINS! Unlike anything I own. 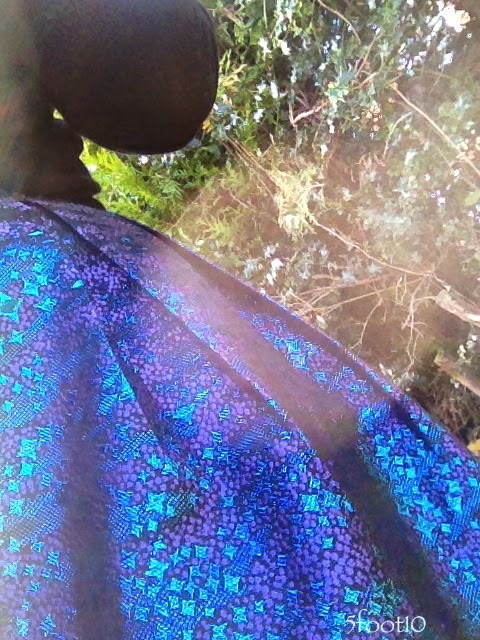 It is strikingly gorgeous and matches the shoes I blogged about in the last post! I can see it paired with a black outfit, small heels and a cute jacket. There aren't too many left but it is an affordable treat and a great January pick-me-up (link). I purchased the one below in the summer it is now in the sale and sits perfectly for any season (winter festive sparkles, or a spring/summer wedding). It is a mixture of silver and gold, meaning that it will compliment any jewellery. The chain strap is delicate and can be be tucked inside, or kept on display if you prefer a more 'shoulder friendly and hands free' bag. You can view further details here. *My camera is charging so I hope to extract my Christmas Day outfit pictures shortly :) An actual OOTD post! Do you like sequin bags? Are you doing anything special for new year? P.s. I have tweaked the blog a bit, and made a new header. I'd love to know your thoughts! Boxing Day Sales. Got to love them! It does get a bit annoying when you see something you picked up a few weeks ago, suddenly appear with a huge reduction! These shoes by Steve Madden caught my eye. They are gorgeous duo-chrome in a turquoise with petrol hue. Be warned, the heel is high, though they are well made. I picked them up full price but had to return them because I fall between sizes. 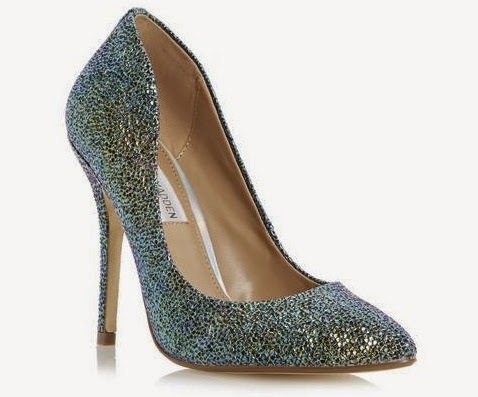 If you are looking for a New Year's Eve outfit (or just a bright shoe to wear to work, then I an recommend these (and they are now £41) at Dune (link) and House of Fraser (link). If your size is not in stock, then keep checking for returns. I have stalked many items which are 'out of stock' until the returns flood in. 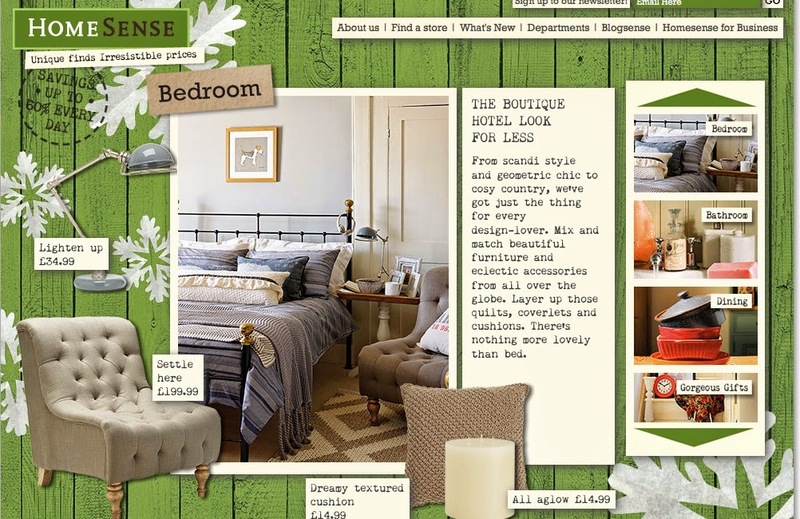 I am also stalking Hush Homewear online a fair bit. They make lovely items (long items! ), and the quality is good. They currently have a pre-sale on (which is 20% off everything). However their real sale starts January 6th (and I'll be pressing refresh from the minute I wake up!). I'm now going to check out the French Connection Sale- I normally pick up a few skirts or dresses from there, an don't find the lengths too bad (though I tend to go for midi or knee length skirts, not the minis!). Where have you been shopping? Let me know if you have posted on what you have purchased! 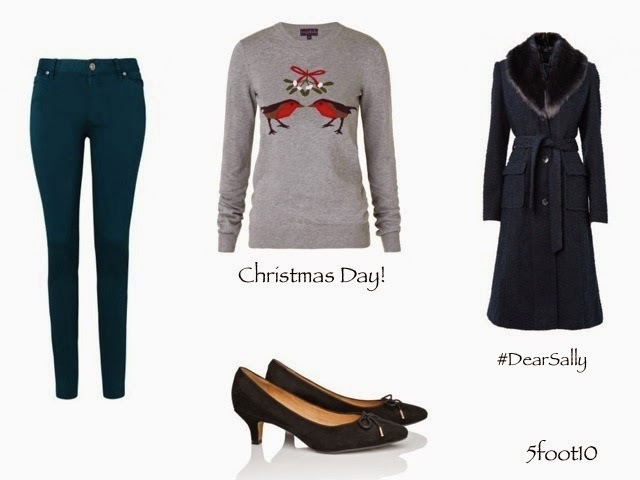 #DearSally My Long Tall Sally Christmas outfit and gift picks! Long Tall Sally asked me to share my festive fashion outfit and gift picks. For us 'taller' girls, Long Tall Sally is a godsend. 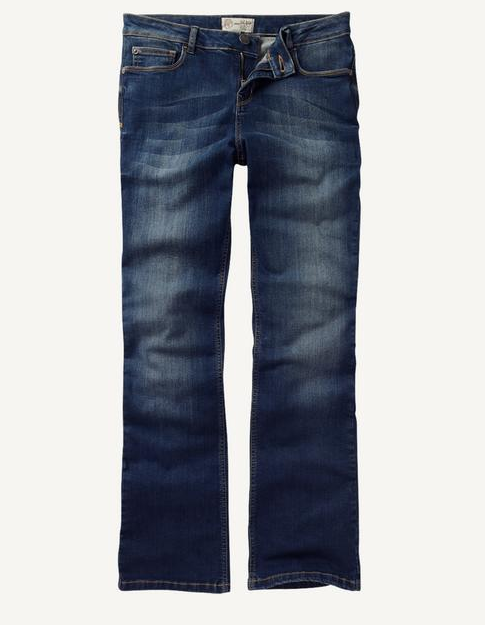 Designed for 5' 8" and up, you don't have to be worried that their top might not cover your midriff, or the jeans might not reach the floor. Each item is designed to fit and sit right- but with a few extra inches in length. Below I share my picks for Christmas Day, a Christmas Party, Christmas Gifts and a Christmas Shopping trip. When I go shopping, I try to keep things simple. Few layers, easy to try things on quickly (in case I get distracted by finding pretty clothes for me! ), not so hot I will overheat in the crowded shops, but not so cold that I will freeze while going between the shops. I normally pair a long jumper dress, with some skinny jeans- however sometimes skinny jeans aren't very warm. These Leather Look Trousers from TTYA x LTS (link) and Two Tone Cowl Neck jumper dress (link) will trap a layer of heat and keep me nice and warm. I love cowl necks as they mean I leave my scarf at home (and done end up trailing it about the shop floor)! I have no idea how long I will be shopping, but there is nothing worse than 'shuffling' down the high street because your feet are on fire! Flats are a must, and I like these Leather Ankle Biker Boots (link). This year I think it will be a 'straight from work' small do, so I will probably be wearing smart office wear. Add a bit of volume to tired locks with a spritz of dry shampoo, and a quick touch of sophisticated darker makeup (For a quick party fix I love Chanel's Illusion d'ombre eyeshadows in Epatant or Mirifique as they can be applied in ten seconds with fingertips- but look like you took 20 minutes). Add a hint of glitter or shimmer lipgloss (Bobbi Brown or Laura Mercier), or a dark berry lipstick (Beguiled by Topshop) and you're good to party at the pub after work! 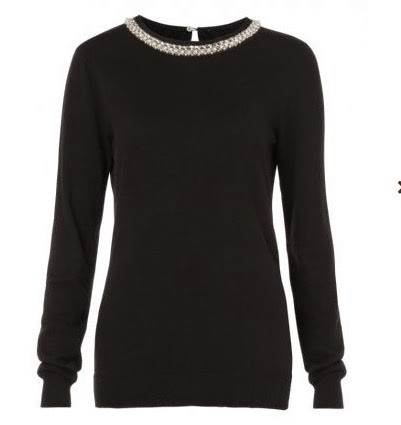 This Necklace Knit Sweater (link) is 2 for 1- you don't have to worry about accessories as it has an inbuilt necklace. It reminds me of something Audrey Hepburn would wear. Depending on how hot or cold the weather is that day, I would pair it with some simple black Leather Look Panel Camden Trousers (link) or a Coated Pencil skirt (link). Add a double layer camisole top (link in case I overheat in the jumper), and a pair of double zip suede boots (link) that transition from day to night seamlessly. However if you're lucky enough to have a Christmas ball to attend (rather than post-work office drinks) then LTS have some great long gowns. 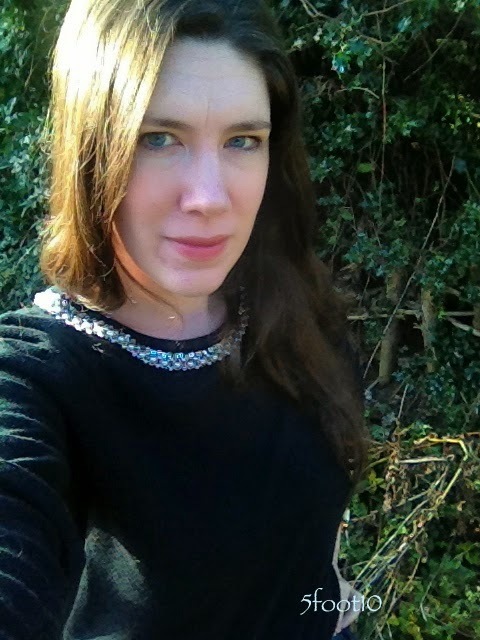 For Christmas Day, it has to be the novelty Christmas Jumper (link), and a pair of comfy, warm jeans (I love these skinny teal colour ones with 'super stretch' for after Christmas dinner!) and low heels (link) so I wont fall over after a sherry or two! If the weather is dry, then I normally end up on a Christmas day walk, so a smart warm coat is essential. This removable fur Boucle Coat (link) epitomises vintage glamour. Add a bold lip (Japonesque have a great burnt red/orange lip paint) and sculpt your hair into a soft wave, and you could be straight out of the 1940s. I am always careful to buy gifts that aren't too 'fitted', unless I know the recipients exact size. This Cranberry Sequin Beanie hat (link) and matching snood (link) have a bit of Christmas sparkle and will brighten any friend's wardrobe. I think the colour will compliment any hair colour making it a universal hit. They are free size so anyone of any height can wear them. They can also be purchased separately. Any cat mad friend will love this Cat Sweater (link) (and if they are under 5' 8" then it'll be a jumper dress or tunic). If your friend isn't cat mad then this Lacy Stitch Knit Jumper (link) is a soft, stylish extra layer, without looking weird if you accidentally buy too big. Tall people often have poor circulation and keeping warm can be an issue. 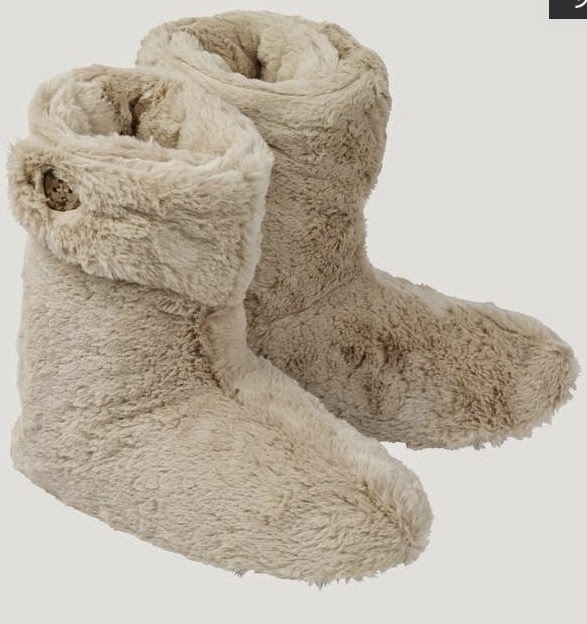 LTS have a cute pair of fluffy slippers (link), and a good range of pyjamas long enough to cover your ankles. I have these cosy, brushed cotton Large Gingham Check PJ Bottoms (link) for a friend, although the Spot Print PJ Set (link) in teal and white also caught my eye. Yes onesies are great (and LTS have a few good ones!) BUT sometimes you want a good pair of PJs, complete with buttons down the front. So there are my picks. I hope this has given you some inspiration and shown that if you are 5' 8" and up, you need not compromise fashion just because you are 'above average' height. I also hope this post has provided a bit of inspiration for those of you who might be purchasing a Christmas gift for a special tall girl in your life. LTS do have some great discounts at the moment so certainly worth a look. What would be your dream wardrobe addition for Christmas? This post is part of an ongoing collaboration with Long Tall Sally. All thoughts, choices and words are my own. I always feel really frumpy and lethargic in winter, so I decided to revamp my wardrobe and fake a bit of energy by wearing bright colours. I may feel like hibernating, but my clothes are radiating a little brightness! 1) I have a slight addiction to Oasis' blouses. They are light, perfectly tailored and have adjustable sleeves so can be worn in spring and summer too. When I saw this lime blouse (although Oasis call it 'Yellow', but it's more a hot, bright lime)... I purchased two. (Does anyone else purchase two of something they love??!) I have the same blouse cut in several other colours and patterns and have had a lot of compliments (link). I now have my eye on the teal one (link). 2) Long Tall Sally Herringbone Aline Magenta skirt. I am a big fan of A-line skirts- flattering to the figure and easy to style for formal or casual wear, however many don't have pockets. I am a practical girl and I love my trousers and skirts to have pockets. (It feels wrong if they don't have pockets- maybe that is just me?) The colour caught my eye, and I plan on pairing it with the cobalt blue coat... unless that is a bit bright... (link). 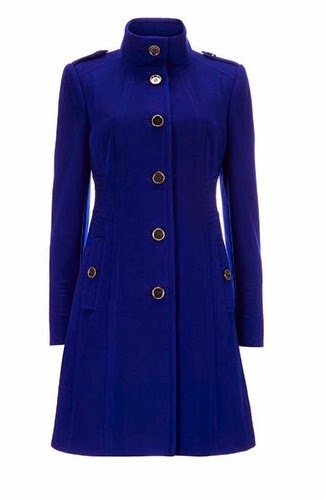 3) Wallis Cobalt Blue Funnel Coat (currently on offer with 20% off!) (link) I love this coat and it fits perfectly. Having mostly had dark coloured coats, I felt it was time to brighten my outdoor attire. A simple way to lift any outfit. 4) I'm now on the look out for a nice burgundy (or red) chunky scarf so I can keep the winter chills at bay. I found this one on ASOS (link), though I am still determined to knit one at some point in my life! If you know any good knitting sites, let me know! 5) Oasis Hummingbird jumper top. I've actually been finding that I can wear quite a few items at Oasis, so it seems they are catering for the slightly taller girl. Layering tops (or cheating and buying a 'fake' layered top) is a great way to gain an extra bit of length- especially with the current trend for cropped jumpers. This one at Oasis caught my eye- I'm a sucker for vintage inspired (bird) prints (link). Are bright colours just for summer? 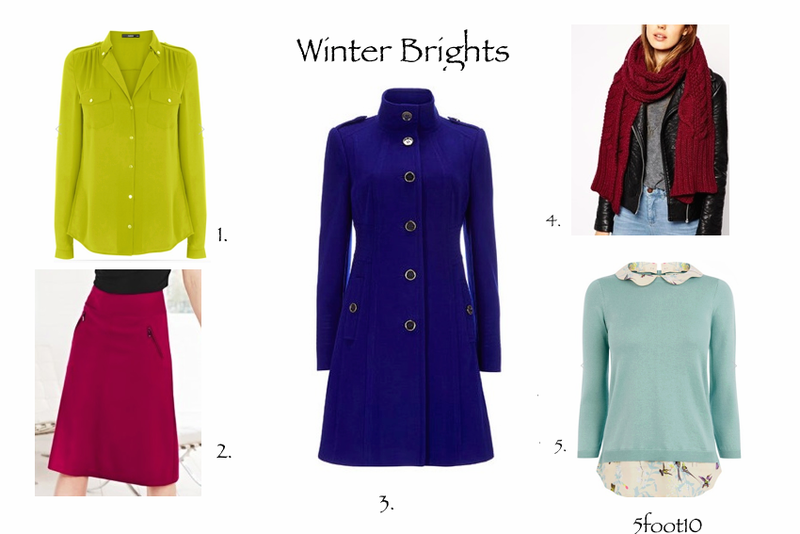 How are you brightening your winter wardrobe? Sunday Service: Autumn, Furniture Purchases and Make-up purging! Just a round-up of life, news, links, and things I like. I was walking through some beautiful autumn leaves a couple of days ago and had to stop to take a photo for instagram. It was too good to miss. 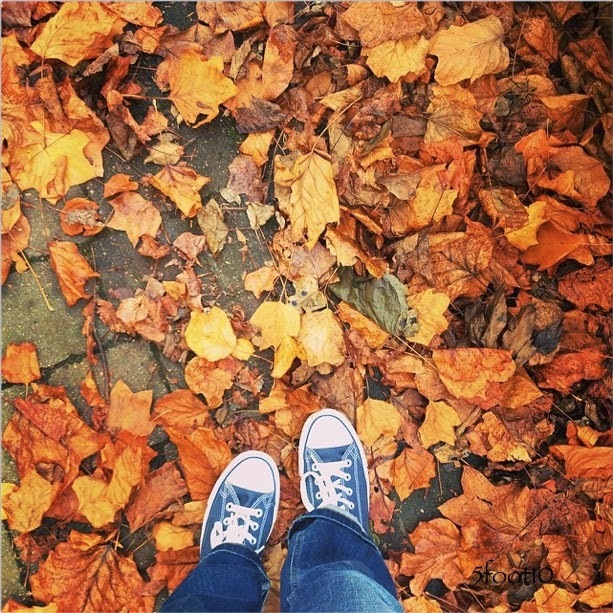 Beautiful leaves and my blue converse trainers (purchased from the great selection at Long Tall Sally (link)). Weirdly the jeans were from Fat Face a few months back. I was really, really surprised that they fit length wise. If you want to check them out then here is the link- I think they were the Smithy Bootcut Darkest Rinse Jeans. Soft fabric with a bit of stretch. Don't forget that if you are a student they will give you money off (and some stores have 20% off for students at the moment). I actually needed a piece of furniture this week, so after stalking pinterest for a day (link) I headed off round the shops. I ended up narrowing it down and then going between Next Home, Laura Ashley, Home Sense and Dunelm repeatedly. I was actually a little scared at how giddy Home Sense made me. I could actually legitimately buy things from there and not feel guilty! Yes I know it is mass produced and most people will have the same things... but it still has this way of making me want to buy fifty things I didn't know I needed. I know I have nowhere to put 10 cushions... but I still wanted them. (I did spot a bunch of NEOM organics for £5-£10 and This Works deep sleep products, so if you are after a bargain then head to Home Sense (or it's sister store TK Maxx). Sadly I have to go back to Dunelm.... hide my bank card! Finally, I've been poorly this last few weeks. It wasn't caused by makeup but it did serve as a timely reminder that generally makeup and skincare products have expiry dates and that clearing them our periodically is good for your health! Take mascara for example, each time you use it you are transferring bacteria from the tube to your face, and then new bacteria from your face into the tube (unless you use a new mascara wand each dip!). Same with lipsticks, pencils, lipglosses (especially the tubs you dip your finger in), and some skincare. If it is broken or smells/looks weird... chuck it. My recycle bin is now full. I felt a little guilty but I now have a bit more space and will 'shop my stash' more! See what Bobbi Brown says here (link). Or see what I wrote way back in 2009! (link) Bobbi uses cute graphics- I appear to have lost the pictures on my post, but the words are still there. That's all for this Sunday Service. What has your week been like?